Champagne Pol Roger was founded in 1849 and now owns 87 hectares of vineyards on prime sites in the Vallée d’Epernay and on the Côte des Blancs. Its cellars run for 7km and are on three levels, the deepest known as the ‘cave de prise de mousse’ at 33m below street level. 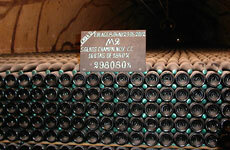 As the name suggests this is where the wine undergoes its secondary fermentation in bottle. The fact that this deep cellar is at 9º or less, rather than a normal cellar temperature of 11-12º, thus prolonging this fermentation, is one contributing factor to the quality and particular style of the wines and their famously fine bubbles. The Pol Roger range starts with three non-vintage champagnes: Brut Réserve NV, Pure NV and Rich NV which are images of the Brut Réserve, the Rich with a slightly higher dosage and the Pure, at the other end of the scale, being sans dosage. The rest of the champagnes are vintage-dated taking in Brut Vintage, Brut Rosé and Blanc de Blancs as well as the Cuvée Sir Winston Churchill.